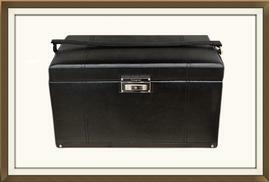 This is a fabulous large, modern jewellery box, with a genuine leather exterior. It comes from the Autograph range of Marks & Spencer's, and was only available for purchase last year. It is now a retired design and can no longer be purchased new from M&S. It retailed at £95. 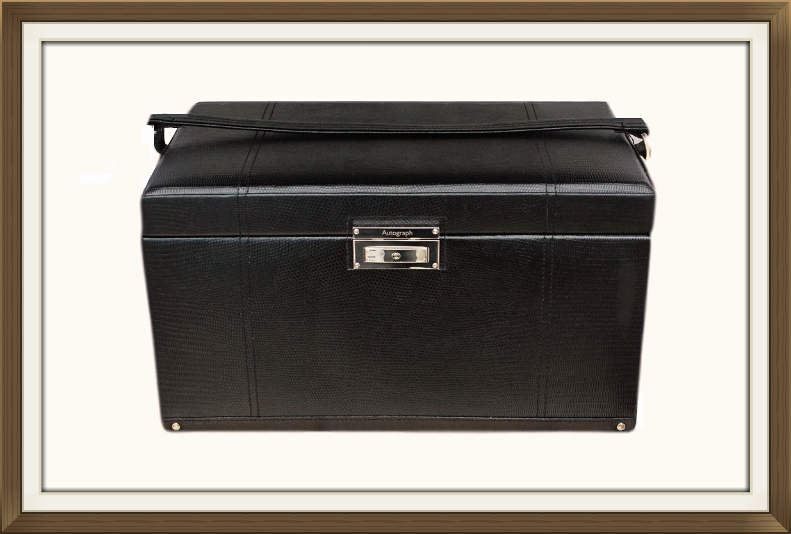 The box has a wonderful carrying strap with silver metal fitments, and a matching silver metal clasp. This has a spring loaded, press in release. The leather has a beautiful textured finish and lovely stitched detail. 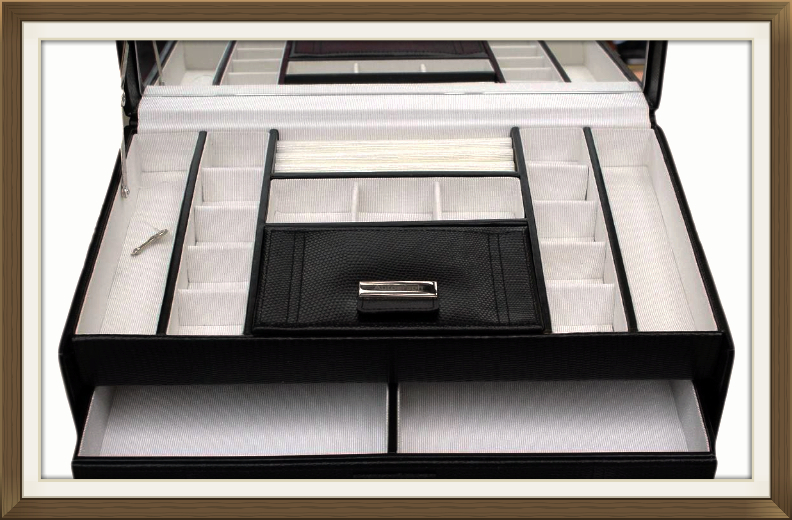 The interior has a fixed storage tray at the top, with multiple compartments and a ring storage section. Beneath the tray are two large storage drawers. This has 2 narrow side compartments, perfect for laying out necklaces and chains. 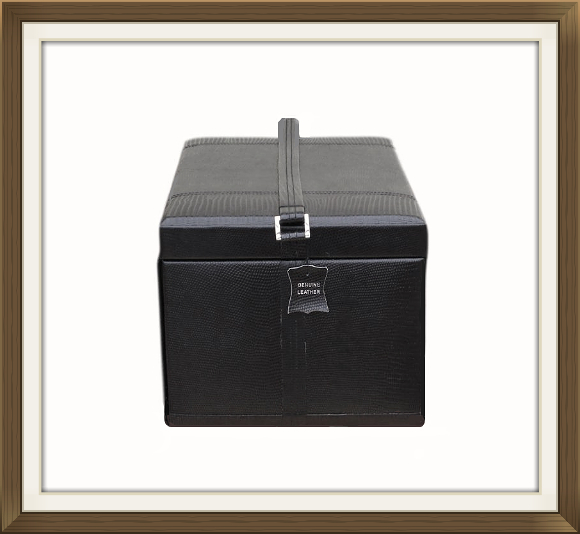 In the centre, at the front, is a lovely compartment, with a lift up leather finished cover. This completely matches the leather exterior. 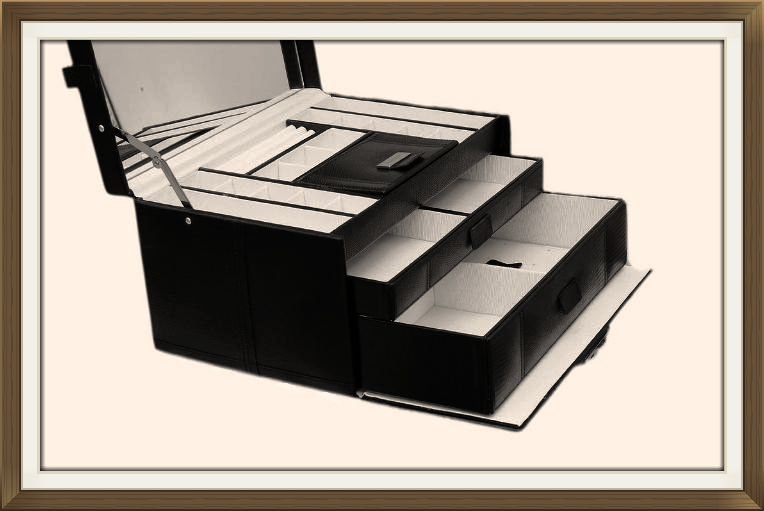 This compartment is the perfect size for slim bracelets, bangles and watches. Behind and to the side of this compartment are 13 small square compartments. These are all the ideal size for small pieces of jewellery such as earrings and brooches. There are 3 ring storage sections at the back of the tray which will hold approximately 21 rings. This has 2 large storage compartments of equal size. These are very roomy and will hold thicker pieces of jewellery such as wide bangles, broad watches and chunky beads etc. This has 2 deep compartments on the left and a larger single deep compartment on the right. This right hand side compartment has a removable padded tray, with nicely punched holes for stud earrings. The tray will hold 8 pairs of studs. 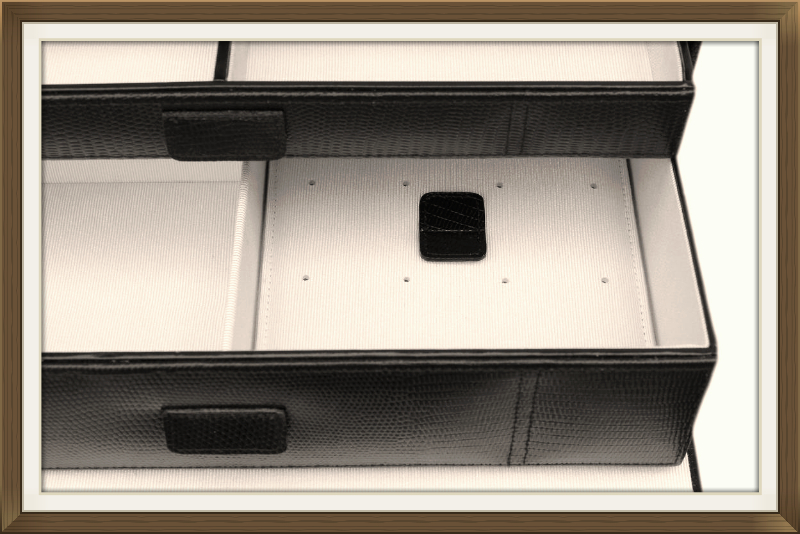 Both drawers are finished with the same leather as on the exterior, and have lovely leather pull tabs. There is a beautiful large, fitted mirror, to the inside of the lid, and all of the compartments are beautifully lined with ribbed silk. This is a lovely off white colour. The lid has a silver metal cantilever hinge which prevents it from falling backwards. The key to the box is still attached to this on its nylon thread. 18.5 by 3.8cm with a 2.8cm depth. All approx 3.5cm square with a 2.5cm depth. 13.9cm by 8.3cm with a 2.5cm depth. Centre square compartments x 3. All approx 4.5cm square with a 2.5cm depth. Each 17.5 by 14.5cm with a 3.0cm depth. 15.0 by 12.2cm with a 6.0cm depth. 15.0 by 5.3cm with a 6.0cm depth. 18.0cm by 14.5cm with a 6.0cm depth. This lovely box has never been used, and is therefore in near perfect condition. There are no splits to the leather and no stains to the interior silk linings. There is some light wear and a few small scratches to the covering on the base of the box. These are the only flaws with the box, and can only be seen if you turn the box upside down. The mirror is still perfectly clear and has no chips or scratches. The box will be posted FREE within the UK, by Parcelforce Express 24hr Delivery.